Here’s another super simple widget, for creating links that generate tweets when you click on them. I use these links a lot in marketing type emails for work and tend to use quick and easy online tools (because I’m lazy), but I’m always slightly nervous about sending links via another website, that might get shutdown or move. You can download the source on github – feel free to hack about with it. It’s just 3 files (including the CSS). You just need a website that supports PHP which most do, and a bit.ly account. Edit the settings at the top of the bitlytotweet.php file to include your source (this can be anything), username and API key. As this script makes use of your own bit.ly account you might want to hide the widget page and not make it public. Click to tweet and share this page! This is an update to my original Raspberry Pi Holga camera case project. 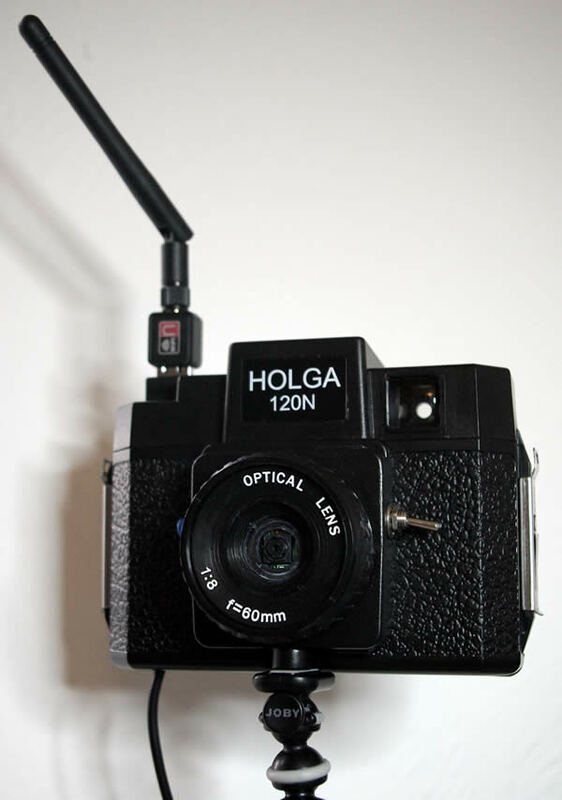 Earlier this year Holga Direct created a digital version of the Holga – the 120d as an April fool joke – although my version lacks the 73 megapixel sensor and retina back display it does actually exist, can take nice pictures and is fairly easy to build yourself if you’d like to give it a try. 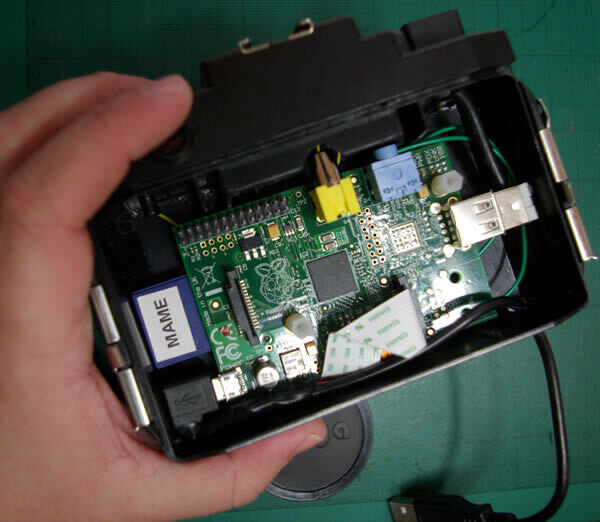 The aim of this is to build a neat case which fits the Raspberry Pi and camera module, and to do a bit of experimenting with the GPIO (General Purpose Input and Output) pins to use them to control various aspects of the camera. Lacking instant feedback and having no idea what you’ve captured until you take it home also fulfils some of the ideas behind retro analogue photography made popular by Lomography. It also looks a bit hipster. 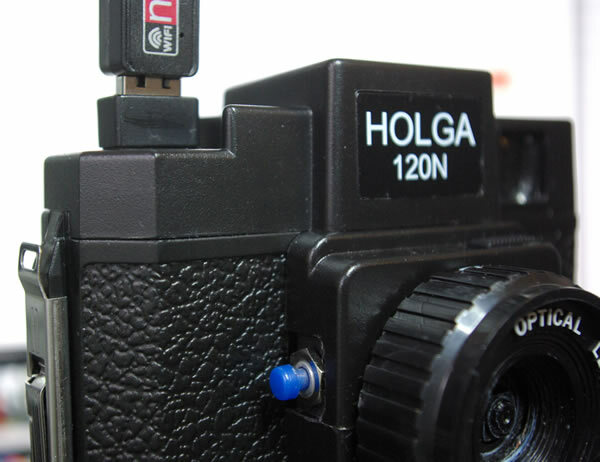 This is a fully working Digital Holga 120d – it used the case from a broken Holga, unfortunately it doesn’t use the original plastic lens (although I have kept this) as the Pi Camera board has it’s own built in lens, however it is now possible to use screw on lenses and filters. 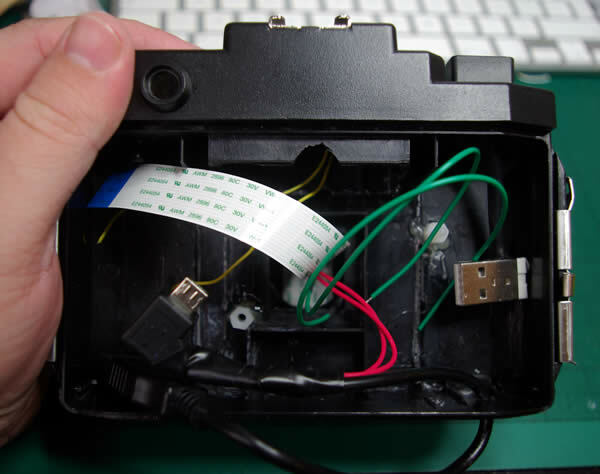 I’ve lost the external USB port as there wasn’t quite enough space inside the case to fit the USB plug – I am now using a nano wifi adapter inside the case – specifically the Edimax EW-7811UN adapter which works well with the Raspberry Pi model A and fits inside the case. A 49mm adapter ring on the front lens – it is now possible to add filters – this is a zomei 46-49mm adapter ring (similar to this one) which screwed in to the original Holga plastic lens after using a dremel to sand down the holga lens until it fitted. 3.5mm plug for external camera trigger – this is a stereo headphone socket with 2 wires attached. Am using a mono 3.5mm cable to use as a cable release driver as I think it’s some kind of standard. Optoisolator flash circuit – this is an LED attached to an image sensor – the model I’m using is rated to control very high voltages. A 3 position rotary switch – to select between video, still photos and program mode. This is a 12 way switch so i’m only using a few of the contacts. I used a big chunky switch I found on ebay which makes a satisfying click when you turn it – it did fit after a dremel was used to cut a larger hole. I’ve used a tap washer to fill the gap between the switch and the camera case. Here’s the 3/4 view with the big clunky switch. It will switch something eventually. I’m currently powering this using a (rather big) Anker USB battery – will likely use something smaller in due course but the Anker battery seems to last forever and powers the Pi with the Wifi adapter with no problems at all. The next step is to build the hardware to connect the various inputs and outputs to the Raspberry Pi. I’ve been experimenting with these using breadboard and hope to solder it all neatly together – with details – for my next project post. Essentially I need to wire 3 switches (shutter, 2 rotary switch positions) and 2 LEDs (indicator, optoisolator) to the GPIO. Then finally there’s the matter of some software to pull it all together. At the moment I’ve been testing using the rather useful BerryCam iOS app – although it seems ironic to be using a device with it’s own much better built in camera to control the camera of another computer remotely, it’s a useful app to test things with. If you use the instructions in the first bit of my post about using the Pi as an Adblock server you can also set the IP address to be the same each time. Update: I’ve added the inputs and 2 LED outputs to the GPIO on the Raspberry Pi – check out this post for more details, circuit diagrams and code. If you’ve lamented the loss of twitter’s v1 API which was switched off in June 2013 – and the ability to generate RSS feeds of your tweets and mentions here’s a handy tool for getting them back. Twools is a set of twitter – tools (geddit?) to generate feeds that uses twitter’s API version 1.1 – you’ll need to apply for an API key to make it work, and you’ll also need a server to host the software. I’m running twools on my cheap-as-chips 123-reg hosting package, so if you’ve got web space that’s capable of hosting a wordpress blog you should be ok. Installation is a matter of uploading to your webspace and following the enclosed instructions on modifing the settings file. One note – this is a beta tool, so it’s provided as-is – it does include password protection, but I’d suggest using a different login to your normal one, and not making the front-page public. The feeds are public but fairly easy to hide. RSS feeds are quite useful (despite what twitter thinks) – it’s possible to use them for things like a twitter badge on your website, or if you’re feeling a bit more creative setting up triggers on If This Then That (IFTTT.com). Twitter triggers disappeared from IFTTT last year – but the very handy Twools can help you get them back. For instance – you want to get an email when someone mentions your website on twitter – or perhaps you don’t want to miss a tweet from your mother in law. Or perhaps you want to drive some hardware with a tweet – like the Raspberry Pi ledborg I had a go with recently. Using the feeds generated by twools you can generate notifications really easily whenever a new item is added to the feed – here’s an example on IFTTT.com. There is a limit built into the API but i’ve not hit this yet. All in all it’s very useful – you can download Twools by subscribing to the newsletter on http://iag.me/twools/ – the author Ian Anderson Gray also responds to tweets. One of the projects I’ve been working on recently is producing an ebook version of a report for the ONE campaign. I thought I’d put together a simple guide to making ebooks which might be handy if you’re thinking of doing the same. Campaigning organisations like to publish and produce a lot of reports about important stuff, and usually publish them in a variety of ways – sometimes resulting in stacks of out of date printed paper reports cluttering up the store cupboard. Traditionally producing online versions of reports – particularly long ones – has been difficult as reading 130 pages of a report on a PC screen isn’t a particularly easy thing to do. However with the popular rise of ereaders, it’s now possible to produce online copies of long reports which can be easily read offline anywhere. Consultants Deloitte estimate that a third of UK households now own an ereader – and sales are holding up (thanks to their low cost) compared to tablets. Ereaders are also more popular with those aged 45-54. First to consider is the format – most organisations produce documents as pdfs since this is the format provided by graphic designers- these work well on iPads and android tablets – but work badly on Kindles and ereaders. Pdfs also often require a lot of zooming to read the text which can make them difficult to read on phones. Fortunately it’s quite easy to convert between the different ebook formats used by kindles, kobos, ipads and other mobile readers – here we can use a very handy program called Calibre. Most ebooks will start life as a long Word document – you’ll need to convert this into a basic HTML format. Don’t worry about fonts, css, or any fancy formatting – just stick to as few HTML tags as possible. You can cut and paste from Word into Dreamweaver and it’ll do most of the reformatting for you – or you can use a free program like Textwrangler to sort out your HTML code. Word often inserts it’s own bizarre brand of HTML into documents, so you need to make sure you clean this up before converting into an ebook. This part is important – the tool we’ll use later uses heading tags to generate the table of contents. Divide up your text into paragraphs using <p></p> tags. Ebook formats also work with most simple HTML tags so you can use things like table <table> tags to organise information, anchor tags, <strong> for emphasis and <a href=”> for links. For more info there’s a simple guide to HTML here. Some tags like superscript <sup> and subscript <sub> don’t display reliably. If you’re not sure, test the html output in an ebook using the steps below. Top tip: keep it as simple as possible. For images bear in mind that most ereaders display in 16 shades of grey – stick to bold, high contrast images. You can use GIF (for diagrams) and JPEG (for more fuzzy images like photos). As a rule of thumb I make the longest side of each image 1000 pixels – some ebooks can display larger images, but this makes it easier to stick to a size that’s compact and resizes easily. There are some more tips on ebook images here from Amazon. Link the images into your HTML page as you would normally and save them in a subfolder next to your HTML file. Next you need to import the HTML file you’ve created into an ebook tool. I use Sigil – it’s an open source tool that’s free to download and available for Mac and PC. Open Sigil and import the HTML file. If you click generate table of contents Sigil will build a chapter list on the right hand side based on the <h1> <h2> <h3> heading tags in your document. Another handy feature in Sigil is the split at cursor option – this splits the HTML file into 2 or more separate files, but has the effect of forcing a page break in your final ebook – this is handy if you want chapter headings or image titles to appear on a page on their own. Once you’ve got your ebook finalised in Sigil, save it in epub format and then import the book into Calibre. Calibre is a really useful piece of free ebook management software which converts between the different formats and lets you take control of your ereader. In Calibre select edit metadata individually – this lets you set the cover (with a useful crop function) and edit the author and publisher information. Once you’ve got your ebook finished export as an ePub (for Apple and Kobo readers) and .mobi (for Kindle) and test. You can check for things like alignment of images, and any part of the book that uses tables or any HTML more advanced than headings and paragraphs. Finally you can publish – Amazon don’t allow small publishers to create free ebooks (unless you agree to only publish on Amazon) so it’s generally best to publish directly on your site – an example is here with ONE’s first ereader report: The Beginning of the End of AIDS – with links to the PDF, Kindle (.mobi) and iPad (epub) versions. My new kickstarter backer Pebble Smartwatch arrived this weekend – and tempted as I was to just put it on ebay straight away I had a bit of a play with it. 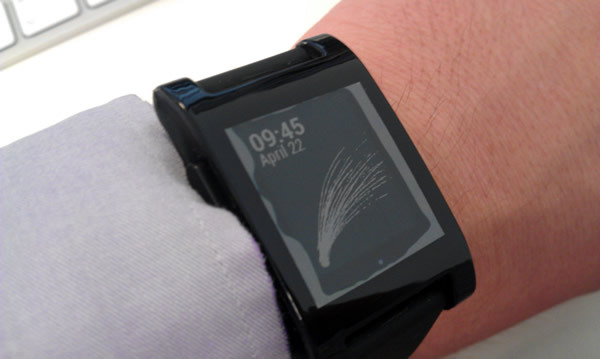 The Pebble is a ‘smartwatch’ that connects via bluetooth to your phone. It’s a fairly simple devices a little bit bigger than a regular casio, featuring 4 buttons and a magnetic charging point. The display (described as e-paper rather than e-ink) is a classic black and white lcd – although it’s not quite as high contrast as the display in a kindle it’s not far off and it updates much more quickly without the ghosting you typically get with an ereader. Out of the box you get vibrating text message, phone call and email notifications, and a few different watch faces – a really nice touch is the shake to activate the backlight function. It’s also possible to control your phone’s music app through a simple pause / play / skip forward and back interface. Battery life is quoted as being a week – although I tend to leave it on charge with my phone every night. Overall it’s a lovely device – perhaps not worth the mega prices cropping up on ebay right now, but worth waiting for. I suspect watches like this will get smaller, cheaper and a bit more robust over time – my one gripe is that I wish they’d included a glass front rather than the polished plastic. As this is a version 1 device – as Kickstarter keeps telling us they are not a store – some of the software feels a little bit unpolished, but there is plenty of potential there for handy remote control functions. And this leads me on to the pebbles killer feature – it’s possible to write software and upload it to the watch using the SDK which has recently been released by Pebble. Which is an online custom watch face generator site – on the left is my design in progress. The website allows you to customise the font size and background image (in this case my website’s logo) and do a bit of tweaking – it then generates a file you can download on your mobile and open using the Pebble App. Rather cleverly it provides the download with a QR code making it very simple to open it on your phone and send it to the Pebble. I’m not going to put this online as there’s something hipster nice about owning a watch face that no-one else has.. and there’s this thread here bemoaning the millions of not particularly good designs that will clog up the more professionally designed sites. Ultimately designing a watchface (or other clever app – am thinking if there’s a Raspberry Pi projec here) properly using the SDK would be more satisfying, but the sheer speed and ease you can do this is amazing. Pebbles are available on Amazon – hopefully they’ll drop in price as orders catch up. You can explore watchfaces and other Pebble apps at www.mypebblefaces.com. Update: Pebble is now on version 2, but mypebblefaces.com has been updated as well. Watch faces can include second counters, analogue displays and battery status. The plugin works nicely – although I did need to add the embed tags – possibly due to some of the plugins I’m running on this site.